Beaches Resorts is a well-established brand of family resorts managed by Sandals, which operates a number of all-inclusive resorts across the Caribbean. Formerly known as Beaches Boscobel, Beaches Ocho Rios Resort & Golf Club is a resort that offers plenty of activities that families will love in a pristine, remote part of Jamaica. 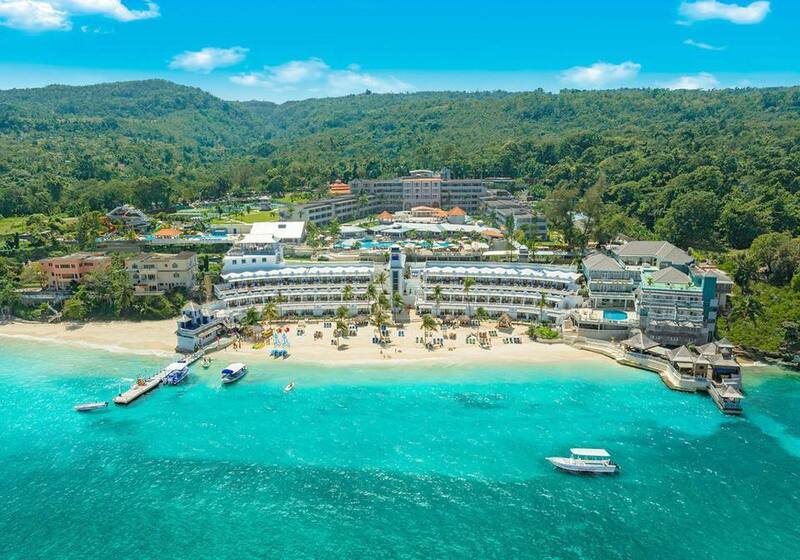 Located on Jamaica's north coast about 10 miles east of Ocho Rios and a two-hour drive from the Montego Bay airport, Beaches Ocho Rios has guestrooms and suites as well as a small beach on 22 secluded acres. The resort is built steeply up from the beach and an elevator serves is available to take guests between the beach and rooms, so there's no need to take stairs unless you want the exercise. Beaches Ocho Rios has a large main pool, a kiddie pool, and the Pirates Island Water Park, which features eleven waterslides, a splash park, and a wave pool. There are also tennis courts, outdoor pool tables, fitness classes, and a spa in addition to the golf on-site course. When it comes to escaping the Jamaican heat, Beaches Ocho Rios has plenty of ways to stay cool no matter what time of year you visit. The beach is pretty and has shady palapas, but don't expect to see a sweeping view of the ocean or much shoreline here; if you're looking for a more picturesque beach setting, you may want to check out Beaches Negril in another part of Jamaica instead. Still, for young kids the beach is fine. Strong swimmers may be frustrated that swimming is confined to a small cordoned-off area, but a variety of local vendors that float on small boats just outside the swim area make a visit to this small beach worth the trip. For those who love underwater-life, Beaches Ocho Rios offers not only free snorkeling trips but free scuba. However, you should sign up early at the watersports desk because spots on this unique tour fill up quickly, especially during the busy season. On the beach, guests can have fun with Hydrobikes (water tricycles), kayaks, and Hobie Cat sailboats. There's much to do but rise early to sign up for watersports, and read activity schedules closely to make sure you don't miss your preferred activities. If you'd rather stay dry on your trip, Beaches Ocho Rios offers a variety of activities on dry land. The 22-acre property features typical activities such as billiards, ping-pong, volleyball, and shuffleboard, but it also occasionally organizes special activities like treasure hunts, basketball tournaments, fitness classes, and arts and crafts workshops for kids. All inclusive golf is a deal for golfers, but you will have to pay for a caddy (and tip as well), and the golf course is at another Sandals resort, 20 minutes away by shuttle bus. Additionally, the resort offers junior golf clinics for kids (clubs are provided), and all ages are welcome at the golfing range. Where Beaches Ocho Rios really shines, though, is with its kids' programs, starting with infant care. After 5 p.m., the resort even offers nanny services for parents who want to enjoy a night out without the kids. During the day, 2- and 3-year-olds have their own group, but older kids' programs typically have evening hours. In the kids' programs for ages 4 to 7, activities include arts and crafts, tennis, and pool games, and for kids ages 8 to 12, there's also snorkeling, bike tours, bonfires, and more. Beaches Ocho Rios has both rooms and full suites, some of which can sleep up to five people. The rooms also include family suites, which have a half-wall, not a full partition as well as terrace rooms with a king-sized bed and sofa bed. Generally speaking, these luxury terrace rooms are attractive and roomy, with a large patio area outside. All units have fridges, and many units connect if you want two rooms for your family. In terms of dining, the poolside Bayside Restaurant is a roomy open-air place with a buffet fare perked up by occasional local dishes and lots of cheese and fruit. Additionally, kids have their own section and kiddie seats, and the BBQ chefs by the kiddies' pool serve delicious barbecue with excellent, fast service. After you're done with dinner and settled into your room, you may also want to check out tours offered off-property. Many tour companies in Jamaica offer trips like the Jeep Safari, river rafting, river tubing, or the Blue Mountain Bicycle tour. Shopping outings are also available, though some guests simply take a cab to Ocho Rios on their own. If you're a single parent looking for a great place you can go to make some memories with your kids without being overwhelmed, Beaches Ocho Rios celebrates May, September, and October as "Single Parents Months." During these special months, solo parents won't be charged the "single supplement" fee that raises the price of a room to what a couple would pay most of the year. Beaches have declared May, Sept., and October "Single Parents months": solo parents won't be charged the "single supplement" that raises the price of a room to what a couple would pay, and special events create a friendly ambiance.